S. Wilson - Welcome to Albany Junior Senior High School! Sara Wilson has been teaching and coaching at Albany High School for 19 years. She graduated from the University of Arizona with a BS in Physical Education and Special Education. Sara went on to teach at Tucson High School in Tucson, AZ where she was a PE teacher and a gymnastics coach. 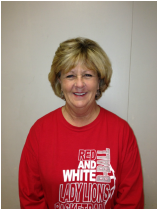 Sara is the head Varsity tennis coach, JV volleyball coach, assistant Varsity basketball coach. Sara is married to Richard Wilson, employee at EBAA Iron, and have three kids. Kindal is a graduate of Texas A&M, Jenna is a graduate of Howard Payne, and Mike is a graduate of Hardin Simmons.